Do you ever look back at photo albums from years ago and wonder where you were when you took those images? 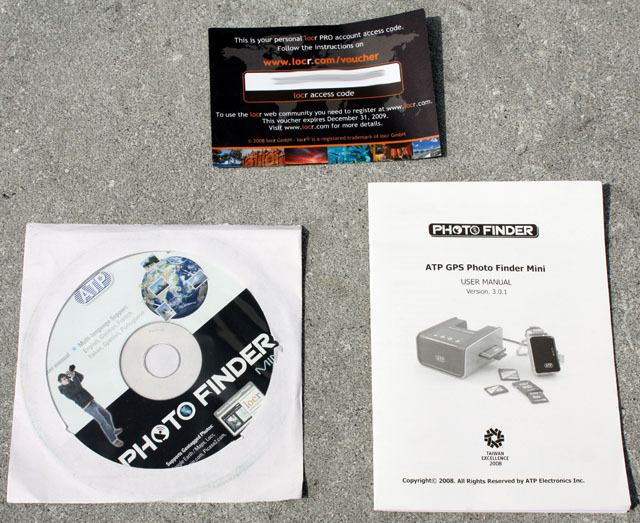 With the PhotoFinder Mini from ATP Electronics you'll never have to ask that question again. This product features a GPS receiver and a docking station to geotag all of your photos, allowing you to look up the exact location with tools like Google Earth or Google Maps. 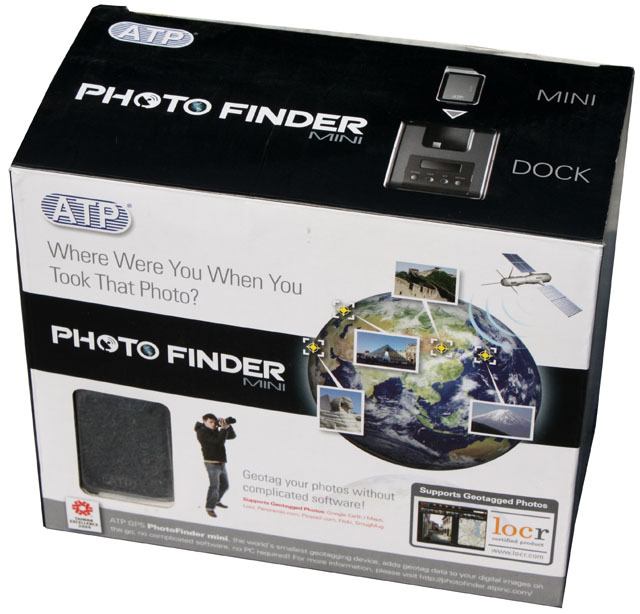 The ATP PhotoFinder Mini ships in a cardboard box, the product is named PhotoFinder Mini because ATP also has a bulkier PhotoFinder unit. Battery Li-polymer rechargeable battery 780mA Max. Inside the box is user manual, a free 1-month PRO account access code for locr.com and a CD-ROM with the user manual in six languages. 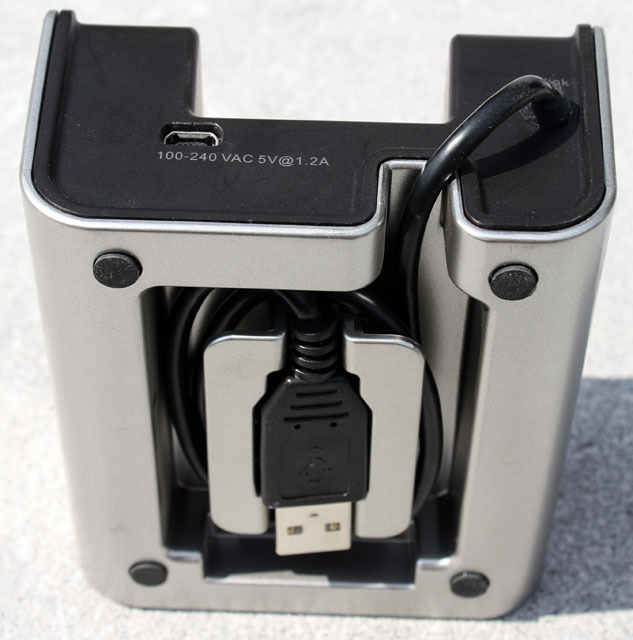 The docking station is made out of plastic and it's pretty big, it's not something you can easily stash away in most camera bags. 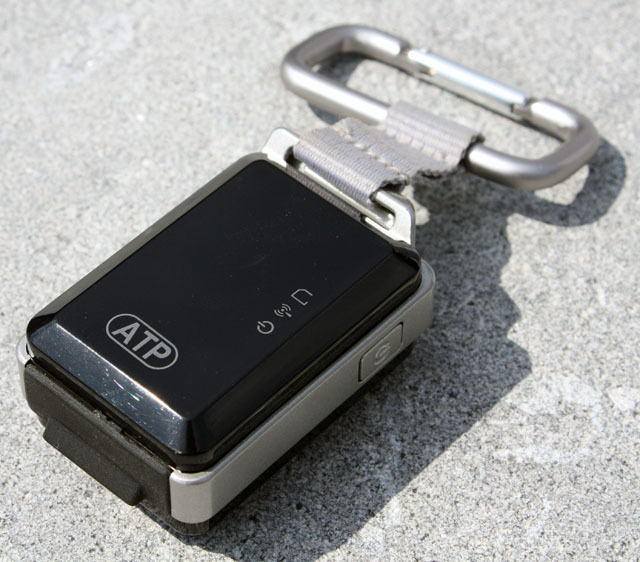 The actual GPS logger on the other hand is very compact and it can easily be clipped to your belt. 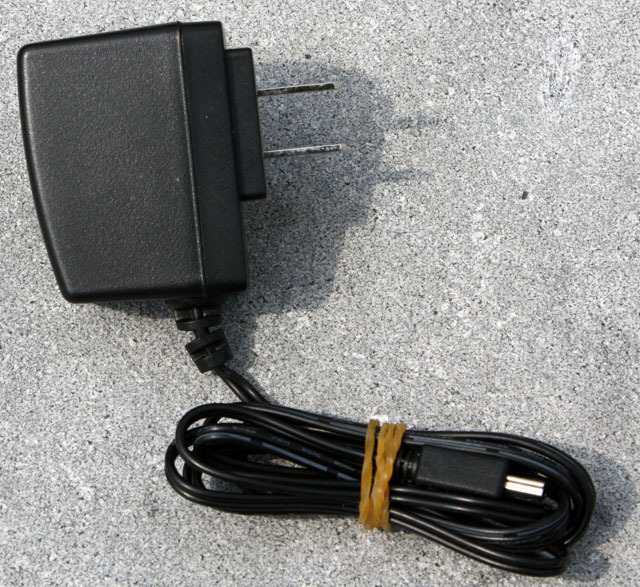 Here's the included AC adapter, you need it to provide power to the docking station because the attached USB cable is only used for data transfer. However, it's also possible to use a Mini-USB cable for power, but this means you'll have to have two available USB ports on your PC. 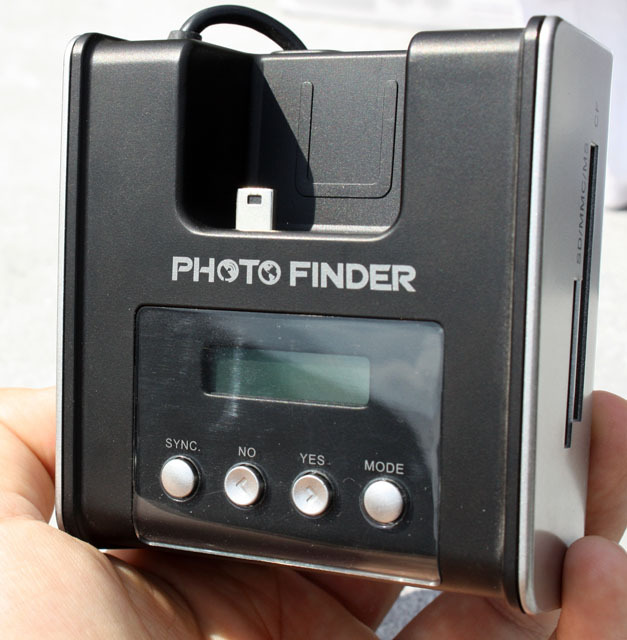 The ATP PhotoFinder Mini dock doesn't require a PC to add GPS data to your pictures, it has a small LCD display and four buttons to guide you through the syncing process. 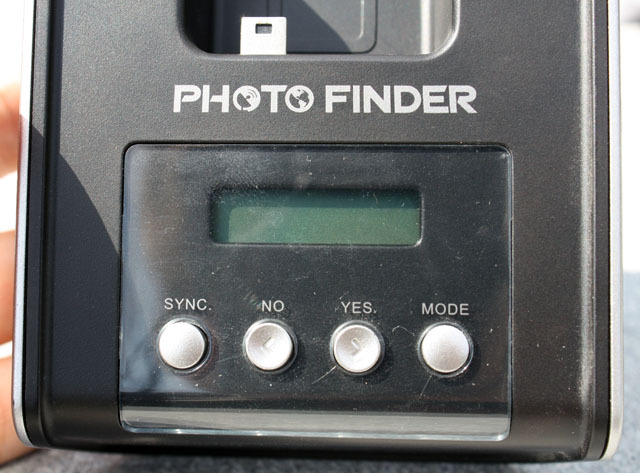 Before using it, you need to match the clock of your camera with the time that the PhotoFinder Mini receives from the GPS satellites. The device adds geotags based on the timestamp of your pictures, so if these clocks don't match the device won't be able to successfully synchronize. 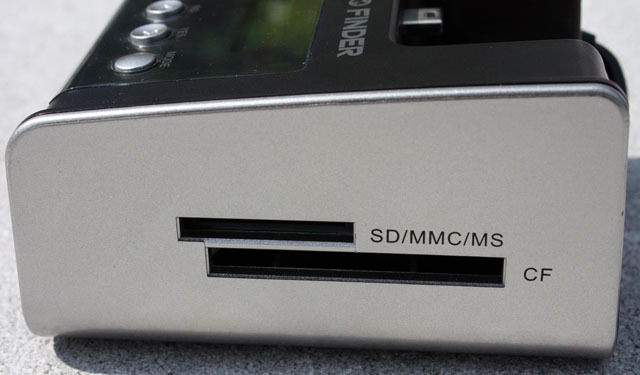 The memory card of your digital camera is inserted in the right side of the docking station. It supports SD, MMC, MemoryStick and CF memory cards. Unfortunately, there's no support for MiniSD or MicroSD. A data transfer cable is located in the back of the unit, but you still need the AC adapter or a Mini-USB cable because the device can't draw power through this cable.